Greetings from our sickbeds where 1/2 of our church seems to have caught a spring virus! Last year, the director of Bethel Christian School came through for a visit to see if there was a connection to be made with our school here. We enjoyed a meal with him between Americans, but that was the extent of our connection. This year a small group of students wanted to come to start an exchange program, but their only available week was during our school’s vacation time. So the Kleins, a family in the church and school who organized the trip, had them come to minister at the church over the weekend. They decided to work on a relational connection and then enjoy a week of tourism, which was exciting for Jeremy, the team leader, because he is also their history teacher and it was his first time in Europe. And since he was raised in Montreal, he wasn’t afraid to dust off his childhood French! We ended up housing him and one of his Canadian students. Because families from all over the world attend the Bethel School of Supernatural Ministry, their Christian school has kids from many nations. One of the boys is from the Netherlands. It was amazing to have five normal 8th graders who were very comfortable hearing the Lord’s voice and unafraid to offer it to others. They gave short teachings Sat. night and Sunday morning, offered words of knowledge to church members, handed out prophetic drawings while sight-seeing and taught the basics of prophecy to my Sunday school class. In the natural, it didn’t look very anointed: the 3 girls were jet-lagged, using posters in English, needing Olivia to translate, and not making much eye contact to keep the kids attention. My biggest fear is bored kids and I started getting nervous. Then just when they wanted to start “activating” the kids, they were called to go back to the adults. With a sigh of relief, I jumped up and started quizzing the kids to see if they had retained anything at all. They had and they were all ready to have a go. I had not had much success in leading them in “listening to God” exercises in the past, but those girls had deposited their anointing after all. Following Jeremy’s model that encouraged taking risks in a safe environment in order to practice and grow, we practiced prophesying over each child in 4 different ways. And they all participated fully. For the first time. It was beautiful. So like the Little Red Hen, I did it all by myself. At least the sun was shining and I was not all alone. The Klein children were at least willing to hold open recycling bags for me so I could practice my shooting skills at the same time. I filled 6 of those and 2 hours later had a dozen smallish trash bags piled next to the giant pile of knot weed. I was promised that the bins would be gone within 24 hrs so that this would not be a recurring event. And they were. Whew! The next international experience was a conference at the beautiful Basel House of Prayer to learn more about God’s view of the Middle East as laid out in Isaiah 19, shedding a lot of light on the refugee crisis. There are entire ministries working and praying to see this beautiful prophecy of reconciliation come true and we wanted a deeper understanding. Over the next 3 days, local Syrian refugees told their stories and got prayer. A Jordanian who is starting an Arab-speaking church for them in Basel, translated. A German pastor who had personally counseled Angela Merkel to keep welcoming the refugees despite protests (and who could pass for Burl Ives) contributed with authority as an early pioneer of this reconciliation movement. A messianic Jewish rabbi from Tel Aviv prayed the Sabbath blessing over us. The assistant pastor of the largest evangelical church in Cairo led a worship set, partly in Arabic. Then the main speaker, Tom Craig, honored everyone’s work and shared on his book, which we are now reading. Praying with the German staff before worship. We were reminded that Jesus is the only answer to the Middle East mess and God is even able to redeem war by getting Muslims to Europe where they are being saved by the thousands. (Unfortunately, it is only the bad news that gets reported because the good news is too dangerous to release publicly!) In between sessions, we were praying and worshiping and getting to know the staff there. David was thrilled when they adopted him as their drummer for the weekend. We also ran into one of our intercessors who came down from Italy and had a delightful Vietnamese lunch and prayer time together. I hope you are coming out of the winter doldrums, enjoying the sunshine on your face and the flowering trees along your path! Mid-month, a new American missionary friend, Christi, invited me to accompany her to Zurich for a women’s breakfast where she was the speaker. Sadly, it was supposed to be a father-daughter trip and he passed away suddenly just 3 weeks before the date. She decided to keep the engagement, but needed moral support for the 2 hr drive without him and I was thrilled to come along, all expenses paid, just before my birthday. It ended up being pure “soul food,” sharing deeply with English-speaking ex-pats during the table talk time around Brené Brown’s theme of being courageously vulnerable. (When Brown’s 2010 TED Talk went viral, her career took off and Christi is a certified facilitator with her Daring Way counseling program.) Christi did so well that my support role was minimal –she was a beautiful model of grace in all circumstances for herself and others! I even got a free copy of Brown’s book, Daring Greatly! Birthday joy continued for the next couple of weeks, including the means to buy a new phone and a romantic afternoon in Colmar, with lots of other surprises and love from friends and family near and far. David did road trip #2 to minister in Orléans last weekend. You may remember that Alana put out a French worship CD last year and David contributed some background vocals. Well, a group of charismatic Catholics and evangelicals there who meet together weekly to promote unity and worship got a hold of her music and invited her to come do a concert! On the group’s site, which is translated “Worship at the Center,” they promoted the event and you can hear one of Alana’s songs, read the program, and watch her promote the evening in French. Alana was surprised to get this opportunity and rented a 9 passenger van for her “Trésor European Tour” with a team from church that included David. It was a 6 hr drive with stops and a very rich time for everyone. The lady battling cancer, that I mentioned last month, joined them as an intercessor and even though undergoing chemo, she felt great the entire trip. The organizer posted this video of David modeling how to “worship with the Word” after a brief teaching. He is singing Heb. 1:3 and got an enthusiastic response during and afterwards from the participants. He wore several hats, playing drums, the cajon, teaching and singing. They were also able to minister to the youth that were present and the organizers also took lots of her CDs to sell! This coming together of different streams came at a good time because our apostolic network of churches in France is currently being attacked by an anonymous French heresy hunter site. Pretty heart-breaking, but a real wake-up call to communicate better who we are. David will be preaching his first sermon at church on Sunday based on the book The Culture of Honor by Danny Silk as another gentle reminder. And on that note, we’d like to make you aware of Pray for France – the only American prayer initiative for this country. David has had lots of email conversations with the founder and was also the main contributor to the worship aspect of the prayer topics. Our pastor also contributed to prayer points for Christian education. Register on their site to get emails with the daily topic of prayer through Easter. They also have a Facebook page! The first 2 months of 2017 have felt like new foundations are being put in place for the future and according to prophetic voices, this is supposed to be an amazing breakthrough year in so many areas! To those of us in Europe, this year also marks the 500th anniversary of the Reformation, and we expect God to bring new revelation to the Church to be a real answer in these challenging times. With our church council, we are now meeting weekly to fast and pray over lunch before starting our “business” meetings. We are still struggling to get the renovation of our building finished 5 years later and that is slowing down the growth of our ministries. We are tired of banging our heads against a wall and against each other as we jostle for space and we are at the end of ourselves, asking Him to come through. We were also back at square one with our preschool program, now that we had finished grieving for Flavy. It was basically up to me to get something of substance in place again, in order for young parents to make it worth their while to get themselves and their kids to church. The death hit the other young mothers very hard and I don’t want to lose them, as all 4 are great moms and the best ones qualified to teach this age group. So I listened to what they needed and wanted and what they could offer over a dinner. Because these kids are already in the Christian school all week, these women want to see them having real encounters with God on Sundays, not just more Bible knowledge or character building. So for the first time in 5 years, we have a real schedule in place where 1 mother + a young person rotates in once a month with clear guidelines, prayer coverage and accountability. With those foundational structures in place, we can go to new places! In my corner of Sunday school for the 6-10s, I have been the only teacher with rotating helpers for the last 3 years, which is fine with me because I still get the worship and communion time, but I don’t usually get much from the sermon anyway. David and I are firm believers that you need to be feeding yourself all week rather than wait to be fed on a Sunday morning. And how easy is that when you have a a House of Prayer to participate in, a Bible lesson to prepare and podcasts at your fingertips? This is a visual generation, so I spend a lot of time digging through images that represent a spiritual truth to teach most lessons. A tablet beaming with gorgeous art and photographs beats the heck out of a flannel graph! Anyway, while surfing for ideas, I’ve realized that free helps for French Sunday school teachers are seriously lacking on many levels and I have decided to fill that void with my own French blog called “Over the Doorposts.” The idea is that kids take home something that is lasting and beautiful that is worth hanging on the wall, fulfilling the command in Deut. 6:9. This year I am creating a Biblical ABC book with the kids and I know it is something that they and their parents will keep in a memory box. I have never had so much fun and see it as a prototype for a children’s book I want to write one day. At the same time, I am dependent on others to correct my text before posting, but it’s high time I started making a concentrated effort to bring my French up another notch. Unfortunately, the lady I enjoy working with the most is dealing with a recurrence of cancer – please lift her up to the Father with us! Another good reason to work on my French is because we will have to take a French test next month as part of our application for French nationality. I have no doubt that our level is sufficient, but still… Applying for nationality feels like another foundation that we need to shore up this year, esp. as our visas expire in 2018 and we are eager to put bureaucracy hurdles behind us. Having the right to vote also feels more important in these turbulent times. With Olivia leaving the nest this year, it also feels like the time to consider a new foundation in the form of a home for our retirement years. An interesting option has come up that could to be the answer to our wants and needs within our budget! We’ll share more details if it starts to look like a reality by springtime. David and I have also been shoring up our marriage foundations this month, thanks to 14 free mini-coaching videos offered by Danny Silk to get us talking about an area where we have disconnected as a couple. It couldn’t have been better timing and we are moving forward again! Greetings from sunny and warm New Mexico, where I am celebrating Christmas alone with my parents – our first one together since Olivia was born back in Denver 21 years ago. I’ve always wanted a break from the exhausting pressure to make everyone happy and everything beautiful, and I’ve finally gotten my wish. I am downright giddy to have nothing more to do this week than to help my dad, shop with mom, eat at new restaurants and write this newsletter. I’ve earned it this year, though you wouldn’t know it since I haven’t written since mid-Sept. That’s because I had a crush of people that needed my support: a friend who was having knee replacement surgery, a new missionary kid who started 5th grade at our school without basic French and needed my intervention, a hoarder who needed help throwing out before her move to a new apt., lessons that needed to be created for a new year of Sunday School, on top of weekly Sozos, church council meetings and House of Prayer sessions. Then at the end of Oct, David’s dad, Jim, had a stroke, stealing his memory and making him less stable. Once he was back home, it was clear that they needed to make the anticipated move to a retirement village. But David’s mom, Florence, would need a lot of support to make that happen and everyone in the family was working full-time. So we volunteered to fly out mid-November and stayed 5 weeks. It was truly a grace-filled time: I cooked and de-cluttered and made sure Jim’s brain and body got exercised daily on the therapists’ off days. David led us in daily worship and prayer and did lots of administration for his mom, while keeping up with his own part-time work responsibilities. Florence dealt with Jim’s more personal needs and starting sorting thru 9 years of accumulation. The bonus was being with family for Thanksgiving for the first time in 14 years and celebrating 4 family birthdays in person! Once David’s parents were settled in their new apt., the cold weather hit hard, so David was eager to fly eastward to be with Olivia for Christmas and I couldn’t wait to fly out west. My parents are doing pretty well, but very isolated from family out in the desert. I’ve enjoyed this time so much that this needs to be an annual trip, as they are usually alone at holiday time and my kids aren’t nearly as sentimental about being together then. However, our absence was harder on Olivia than anticipated because our church went through a tragedy while we were gone. A young family of 7 moved into our village/church/school community a few years ago (4 girls and a boy, ages 2-11, the youngest having serious heart defects.) Guillaume was a teacher at the school and was being groomed to take over as president of the school board. His wife Flavy was a beautiful stay-at-home, vegan mom that I had befriended as a neighbor. Her kids filled half of my SS class and she had just taken on the preschool program at church this fall. Then to everyone’s shock, she caught a flu and died of meningitis 5 days later. Of course we weren’t getting any emails to pray until she was in the hospital, so the news was very sudden and hit the day before Thanksgiving, making us very grateful to be near our family. In happier news, Olivia now has her dual citizenship and showed me her French passport over Skype this week! David and I hope to ride on her coat tails, applying for citizenship next year before our ten year visa expires. This will reduce the time we spend on bureaucratic paperwork and allow us to vote – the candidates are looking promising! In July, our intrepid Olivia took buses, planes, taxis and trains to get herself to a language school in Petrozavodsk, Russia. It is near the Finnish border – a 1700 mile trip even from the eastern border of France! While I was having flashbacks of “Taken,” she was befriending wild dogs in the park, making a video with her Italian classmate (far L) in a restaurant as a homework assignment, and discovering dill as an all-purpose seasoning. I believe it rained almost everyday, but she had a great host family set-up, learned A LOT of Russian (see the video for proof!) and got to speak at a church while seeing iconic Moscow on the way home. Putin’s anti-terrorism legislation went into effect while she was there and she was able to encourage evangelical believers there who had been fasting and praying against it. Why? Here’s the scoop for the uninformed. Once Olivia was safely home, our Anna, who boarded with us in 2013-14, returned to spend her last days of vacation with us while we house sat in the countryside the first week of August. David completely unplugged from computer screens and relished passing his days creating music for pleasure and devouring our nephew’s first novel! I relished the peace and quiet without traffic or neighbors, drying clothes in the sun, taking care of pets, a yard and a garden and eating out on the patio everyday. With Olivia in recovery mode, I think the girls enjoyed doing absolutely nothing! The following weekend we were invited to give our testimony and speak about the spiritual state of France at the YWAM base in Freiburg, Germany during one of their evenings open to local friends of the base. It was a lovely time of connection with about 20 people, complete with crepes. The base leaders housed us and fed us and the next day we took the scenic route towards Zurich to meet up with Tim and Sue Ellis who were in the “neighborhood” for an AIA (CRU) mission trip and to celebrate their 30th anniversary. They were married 2 weeks before we were and David and Tim were each other’s groomsmen, so it was fun to be together to mark this milestone! Our own 30th anniversary trip was the grand finale this summer. In a newsletter 2 years ago, I mentioned that I wanted to do the Sound of Music tour in Salzburg one day. But David thought it would be too expensive since the 10 hr train trip would demand more than a long weekend stay. And then we heard about a “Worship Vacation” offered by the Salzburg HoP – Free room and board for each day that you do 2 hrs in their prayer room, and perfectly located for sightseeing. Suddenly, a week in Salzburg was feasible! Not knowing the comfort level or privacy of the rooms, nor the food quality, we reserved 3 days there and our last 2 nights in a nice studio for guaranteed romance. The trip exceeded all our expectations! The HoP is in a Catholic missions base that is beautifully decorated and backs right on the Salzach river. Bike and pedestrian paths pass right between the river and the HoP and they were still constructing an entrance where the public can walk in or have a drink in the adjoining café. We loved worshipping mainly in English together and praying into the river of worship joining the physical river to touch everyone passing by! Staff were busy with a leadership seminar that week, but the young people in attendance were delightful to share meals with. The icing on the cake was that our room was hotel quality, freshly renovated, overlooking the river! After re-watching The Sound of Music, reading reviews and checking the weather forecast, I booked the 3 things we wanted to do the most in advance and David made sure we got there at the right time with as little walking as possible. I had fallen twice over the summer and couldn’t walk more than 5 min. before feeling discomfort in my foot and leg. But the city is small enough that transport is reasonable and convenient. A taxi got us to and from the hotel and Mozart dinner concert. A cable car got us up a mountain and we LOVED the Fraulein Maria Bike Tour! I unconsciously started singing The Sound of Music songs as soon as we arrived and they carried me through the week! Now that we’re home, David is working furiously to get our new website up and running before he has to return to school briefly to orient his IT replacement. And it is now possible to give to us on-line through the Bread of Life church website! Thank you supporters, for your generosity this summer that allowed us to celebrate our 30 years so well!! I have a good reason why you didn’t hear from me this spring – the last couple of months were spent planning the details for a trip to Indianapolis to surprise David’s parents and I couldn’t talk about it! It had been 4 years since our last 6-week marathon visit and David’s mother in particular was feeling it. So after friends here reminded us that God cares about our family connections as much as our missional life, we overcame our own reluctance. We decided to believe that God would cover the finances needed, that our kids and parents needed real hugs and that we could still survive 15 hours of travel with 2 layovers, jetlag and high security pat-downs. We timed it around Memorial Day weekend for David’s mother’s birthday, the 100th running of the Indianapolis 500 and our kids’ move to a smaller rental in town. We limited the trip to 2 1/2 weeks in one city to keep it simple, praying that my parents would be able to fly out to see us from New Mexico. We wrote to our intercessors in April to keep us and my parents covered and started preparing a 30 min. video of family memories to show at the surprise birthday party that also honors David’s parent’s 60th wedding anniversary this year. It was a wonderful heart exercise to go through 30 yrs of photos and videos and see the generational blessings that have come from a drama-free family of faith. The travel day wasn’t nearly as painful as before, and it was good to leave our cold, rainy weather behind. Summer arrived here only yesterday! We got to love on David’s dad, who is losing his memory but not his dignity, and made sure David’s mother was coping well as the caregiver. In return, David’s parents rented us a new Chrysler to make the hours criss-crossing the city a lot less stressful, and I got to bond with my 2 amazing grand nieces up close and personal. Rachel was grateful for our help with the last minute push to get their previous rental cleaned, painted and the basement junk cleared out, and David got a break from the work when he was given a great seat and chauffeured to the race by an old friend. And another friend’s mother, who was still missing her husband taken too soon by cancer, graciously welcomed us to sleep in her basement after we moved out of Rachel’s house, perfectly located to be near my parents, who were staying at my brother and his wife’s house. My parents did make the trip, despite physical attacks, and were so glad that they did, and my dad got on Instagram to strengthen our long-distance connection! And when I broke the frame of my glasses, my brother was right there able to weld them back together perfectly with a laser machine at the jeweler’s where he works, saving me $800 for a new pair. Sweet vulnerable conversations were had with several family members, local supporters and friends that don’t communicate well at a distance. And finally, our spirits were also ministered to during visits to three small congregations that were pursuing real intimacy with each other and the Lord, giving us an encouraging view of a shift in American church life! Fun news about Olivia’s world next month! 17 March – My 3-month wait for a gynecology appointment finally arrives and I leave with a year’s worth of hormones in hand for a total of $10! I am believing that all of the physical and emotional struggles of the last couple of years will soon be a distant memory!! An early birthday box from my mom provides a new outfit for the weekend! 18 March – The church council decided to rearrange the sanctuary to create a corner especially for all the young families so that they have some breathing room with their toddlers. I spend the morning taping down the carpet, decorating it with an Easter theme and setting up multi-sensory pre-school worship activities. This kind of project gives me lots of life! Afterwards, I take Nadine out for lunch for our monthly quality time to celebrate my hormonal reboot and we happily bask in the warm sun on the terrace afterwards. 19-20 March – We drive to Ludwigsburg, Germany with friends for Bethel Music Worship Night! Nothing pumps me up more than joining the voices of 5,000 Europeans singing my favorite worship songs with my favorite worship leaders (in English,) living out the Psalm that says, "I will sing your praises among the nations!" 21 March – We finish covering the knotty pine paneling and stairs with paint – our dark Alsatian house is transforming! Here are the promised photos of the half bath and the glass blocks reflecting the new paint! I open Olivia’s and my mother-in-law’s gifts – prophetic encouragements to remain joyful and childlike: sidewalk chalk, a Belgian children’s film, and a 2006 Newbery Honor book! 22 March – How dare the terrorists try to ruin my birthday (and our pastor’s trip to Africa!) My French penpal sent me a miniature spring garden that serves as a lovely In Memoriam for the victims. Our pastors got re-routed a day later. I go ahead with my plans to spend the afternoon shopping for Easter needs in Germany with Jocelyne. It is our first "girls day out" together – delightful! Topping off the day, Nadine and Alana come by for a surprise visit with flowers and gifts – My friendship cup overfloweth!! 23 March – I get a new haircut, then bring lunch to share with Helen during our weekly get together. She gives me my third bouquet of flowers! Then I’m off to do a sozo and finish the evening with a Skype with Rachel. 24-25 March – These are big prep days for our Sat. tabernacle and Easter guests, esp. since everything is closed on Good Friday. David spends these days and more re-organizing the stage for better sound with the new sanctuary arrangement and coordinating all the details needed to make 6 groups and 12 hours of worship go smoothly for tomorrow’s event. Each year he does it with more grace! 26 March – Our church’s annual Purim 12 hr tabernacle. This year we had the privilege of 2 nationally-known French worship artists doing a set since they were already in the area playing for the big annual youth conference at the local mega-church! Their drummer was sick, so David had the thrill of playing with them and I got to feed them dinner before they went back for their evening concert. The council felt that this year’s event carried more weight than past years, considering the times we are living in. With our pastors in Africa, we were proud of ourselves for carrying off this event smoothly in their absence. I was thrilled to have the energy to participate in all of it, which I couldn’t have done a week ago! It was a 14 hr day for us, so no Sunday service was scheduled after that colossal effort! We changed our clocks today and I almost didn’t get the lamb in the oven in time! Our 3 singles (too far from family) arrive at 4 and when the discussion turned towards wine or French literature, I feel like I am living out a scene in a French film! I sit here typing to the happy sounds of home renovation, taking potty breaks with a brisk walk to the center of town at the public toilets, (in awe of the mid-Nov. balmy weather God has set aside for the work) and reflecting on the very emotional last several weeks. Backing up, I mentioned last month that I was going to sozo my body issues. Working in the church bubble, I had a powerless mindset concerning my neighbors (described here.) But after feeding on teachings for the last few years that one has to start taking risks to continue growing in faith and to see God move in the lives of others, I started getting hungry. I even asked Nadine to keep me accountable to invite the neighbor mom over before the month ended for added pressure. Then during my Sozo, the Holy Spirit showed me the connection between my feelings of powerlessness linked to the next door neighbors during my childhood and my current ones. With that healed, the Holy Spirit gave me with an even better plan that would not be so intimidating. So I marched over, knocked on the door, apologized to the dad for not inviting the kids over sooner and invited the mom and kids over for an autumn party on Halloween afternoon. I kept it simple – they were at the perfect age to enjoy playtime in my attic at 5, 7 and 9 yrs old. I bought a pumpkin for the 11 yr old boy to transform with an electric drill. Then we had a simple snack time that was completely new for them: mini pumpkin pies (made with the 9 yr old the day before,) popcorn, walnuts to shell and hot apple cider. Apparently the 7 yr old had been praying every day that I would invite them over, ever since I made a serendipitous connection with them last Easter. So they arrived promptly with bells on, bearing colored Halloween pages. The mom was quiet and simply observed her kids having a ball without interfering. They left the attic spotless and hunted for hidden suckers before leaving. I was smothered with hugs and kisses on their departure and sent them home with the pumpkin to light and put out on their balcony so that we could enjoy it from our bedroom window that night. We had to take a photo because it was the first beautiful thing in 8 yrs that we’d ever seen in the courtyard. And just when David was finally ready to snap the picture with a long exposure on a tripod, the tea light burnt out! So I grabbed some matches and a second light and ran out back to re-light it while they were out trick or treating. It was soooo worth it because while the letter A is their family initial, it is also mine, and it felt like a living, breathing thank you note. Other neighbor encounters have happened in the same time period: the Jehovah’s Witness neighbors across the street have never been too friendly, but I struck up a terribly frustrating conversation with the husband one evening when he was out hanging up the laundry. Turns out his wife had been in the mental hospital since August and he said she was coming home soon for a trial visit, but that there was no such thing as a miracle. I replied that I saw miracles weekly and let him know that I was available if she was interested in seeking more help. She’s still home several weeks later and I’ve been wondering how to love a little more concretely, knowing that at least he is very wary of non-JWs. For my devotional today, the assignment was to think of an unsaved person and draw them a prophetic picture. I chose this woman and made it in the form of a card with calligraphy and watercolors. I included some chocolates and my cell phone number and popped it in their mailbox with the hope that she will be touched! 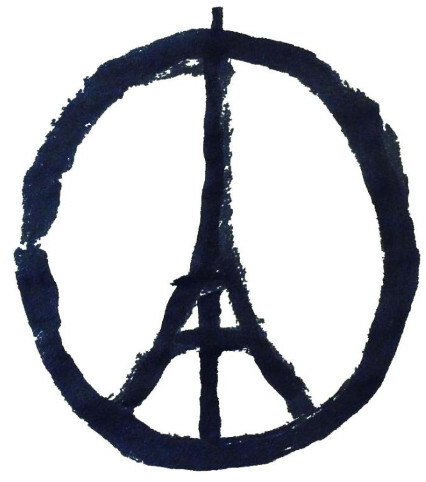 And that brings us to the Paris tragedy on Friday the 13th. Sunday morning we had planned to honor the Richards for all that they brought to our church over the years. I was in charge of filling up a little album during the worship and announcement time with love notes from the church family. But when the band started playing this song, I ran in and warred against the spirit of powerlessness in the face of terrorism by dancing and spinning with Olivia, waving the French flag in the middle of the worship banners and exhorting the church to take this as a unique opportunity to offer God a sacrifice of worship during this time of grief, mocking the enemy with songs of victory! And then we loved on the Richards. Because in the end, powerful love will always conquer death.